2. Study for ‘Memories Coast’. 1923-45. Watercolour over earlier pencil drawing. 4.125 x 6.725 inches. K782.01. 3. 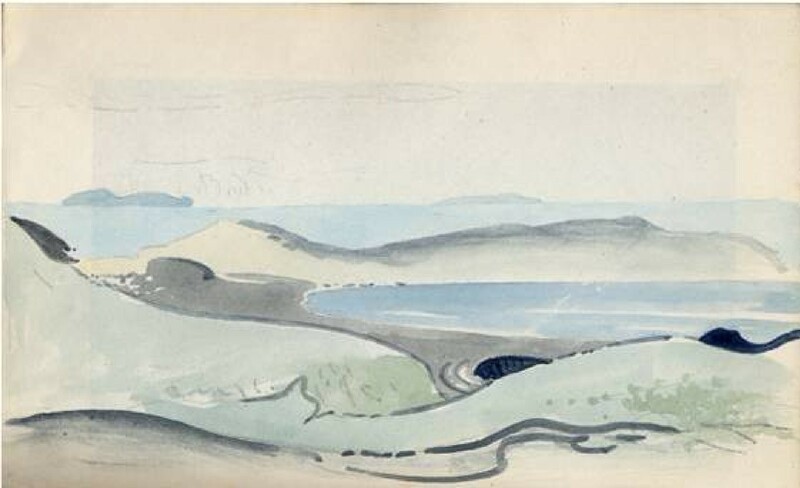 Study for Coastline with Islands. 1923-45. Watercolour on earlier pencil drawing. 4.125 x 6.725 inches. K782.02. A feature of the whole Collection is that though much of RMS’s work is small in scale it is not small in concept. As we approached the completion of the text-only version of the Catalogue, attention inevitably focussed on those small, sometimes tiny sketches that had previously been overlooked. But if by “sketch” we mean a rough jotting of lines just sufficient to remind the artist of his purpose, then, for the most part, these are not sketches at all. Many might be categorised as ‘Romantic or Surreal Images in Miniature’ in their own right, for the best of them carry the impact of more fully developed drawings. To suggest a musical parallel, drawings (like 1, 2 & 3 above) might be enjoyed like short piano ’études’, as defined in the musical dictionary to which RMS often referred. A PDF version of the Catalogue Raisonné may be prepared. K.1200.00. 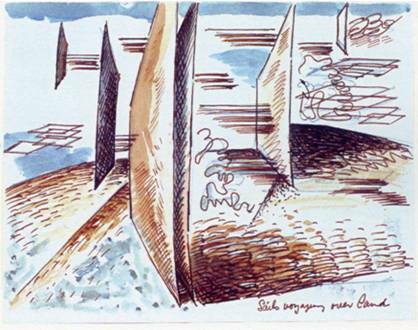 Title: “Sails Voyaging Over Land”. Medium: Pen & ink on paper. Height: / cm. . Width: / cm. 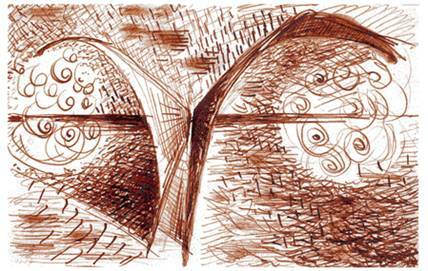 Commentary: In his post-war work RMS played with geometric as often as with organic symbols, using both of them as themes, combined freely as in music, without topographical restraint. Sometimes they were used exclusively, but more often organic and geometric symbols were used in combination. 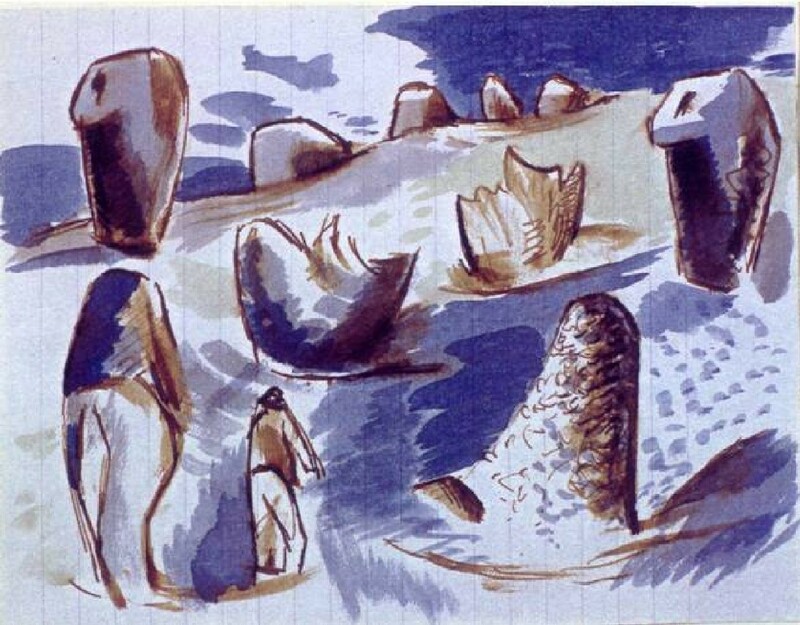 In this example there is particular emphasis on planes that approach each other but cannot touch: all kinds of variations followed in other drawings, as with “That Approach but Cannot Touch” (K.1386.00) in 1954, and Surfaces Standing On and Floating Over Beach with Distant Mountains (K.1523.00) in 1958. K.1386.00. Title: “That Approach but Cannot Touch”. Medium: Pen & brown ink on white paper. Height: 4.5” / 11.4 cm. Width: 7” / 17.8 cm. Commentary: In this version of RMS’s widely explored theme, of forms that approach but cannot touch, the tempo is raised. 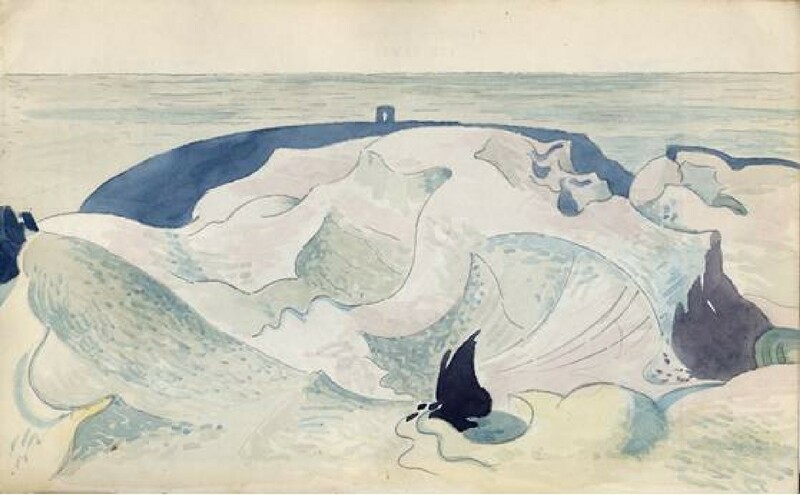 If compared with “Sails Voyaging over Land” (K.1200.00) 1950, which has the serenity of gentle movement, the tautly curved planes in this drawing suggest the threatening clash of fierce opposition, impelled by barely visible forces, whirling in the concave spaces under their ‘wings’. 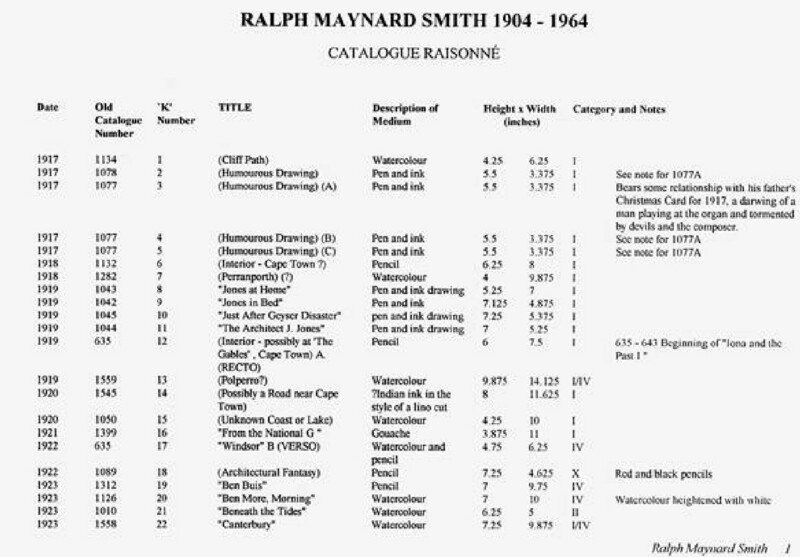 THE CATALOGUE OFFERS ACCESS TO THE SOURCES OF RMS’ IMAGERY. By finishing the text-only version of the catalogue, we are now able to cross-reference all RMS’ paintings and drawings and see the relevance of some aspects of his work clearly for the first time. 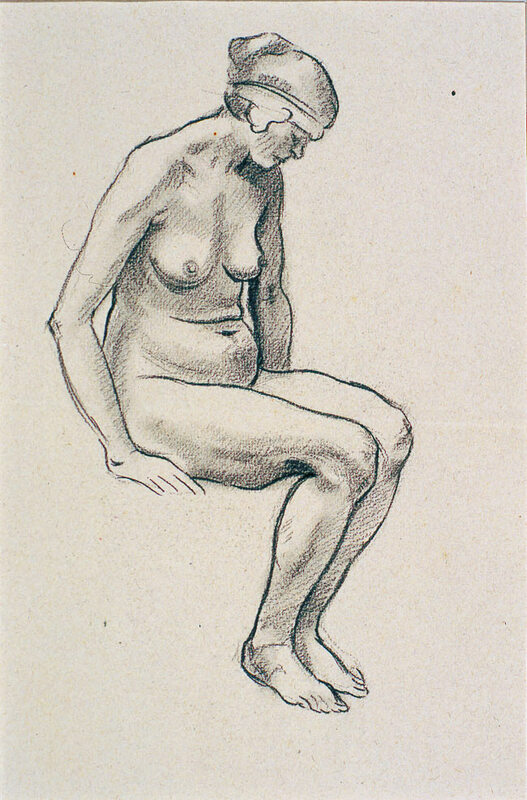 For example, we see the importance of his figure studies, from the early life and anatomy drawings at Heatherleys to the later ‘eye-level’ series in the 1940s, in which the forms and gestures of figures are seen as shapes, ready to transform into surreal ‘organic symbols’ and their gestures are echoed by the rhythmic themes of strange landscapes. 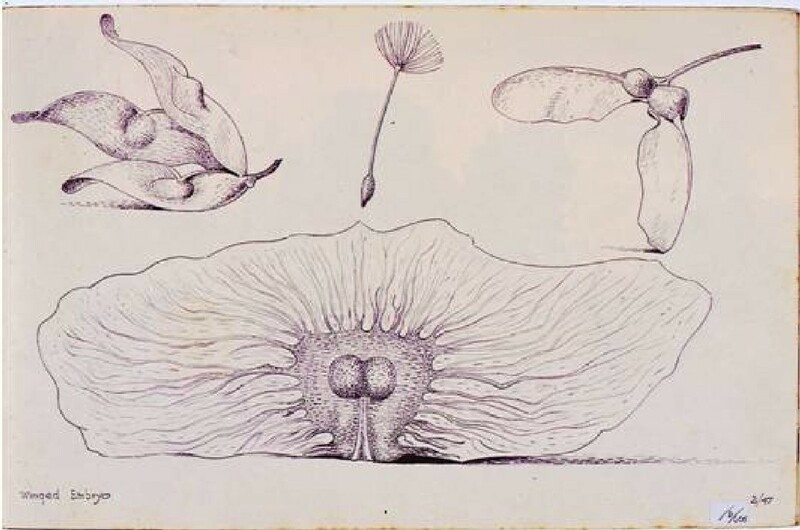 Whereas early examinations of RMS’ work suggested that his “organic symbols” were derived solely from plant and seed forms, it is now clear human forms and gestures were equally important sources. 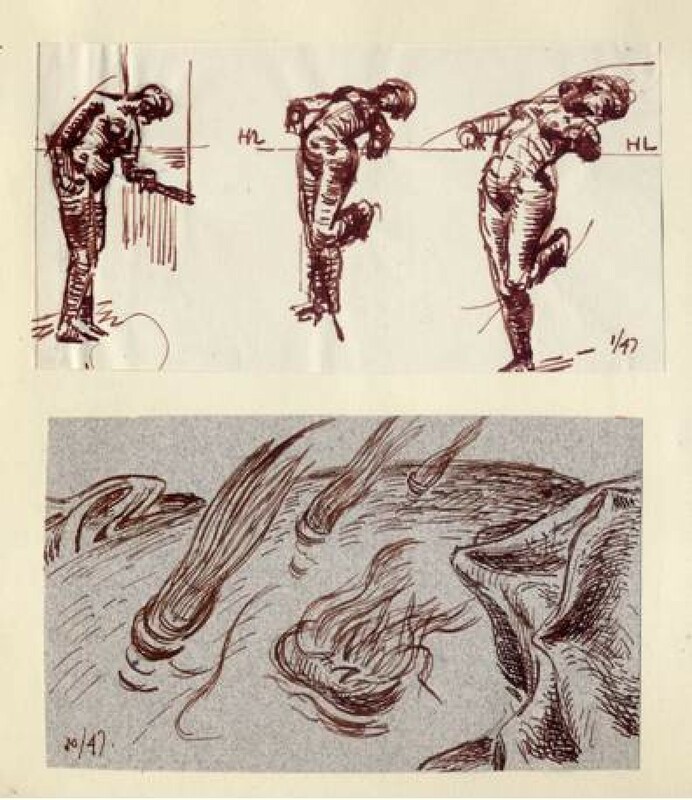 Those observations highlight an inherent danger in RMS’ chosen path of action, that by ‘ranging about’, focussed achievements might be dissipated; but conversely, that ‘ranging about’ also built a strength, in that his wanderings and experiments would add great richness to his experience — and the diversity and inventiveness of his late drawings are evidence of that. Roger Cardinal, in his Introduction to the monograph on RMS’ life and work published in 2004, observed “… However there must be a dialectic at work here …”, which makes the case for introducing illustrations throughout the database and the catalogue, so that RMS’s ‘ranging about’ (and his fusion of the results) can be followed over many diverse fields — the human form, observations of contemporary life and humour, as well as plant drawings and botanical studies — by evaluating their significance directly from the images without reference to words, and thus seeing “the dialectic at work”. 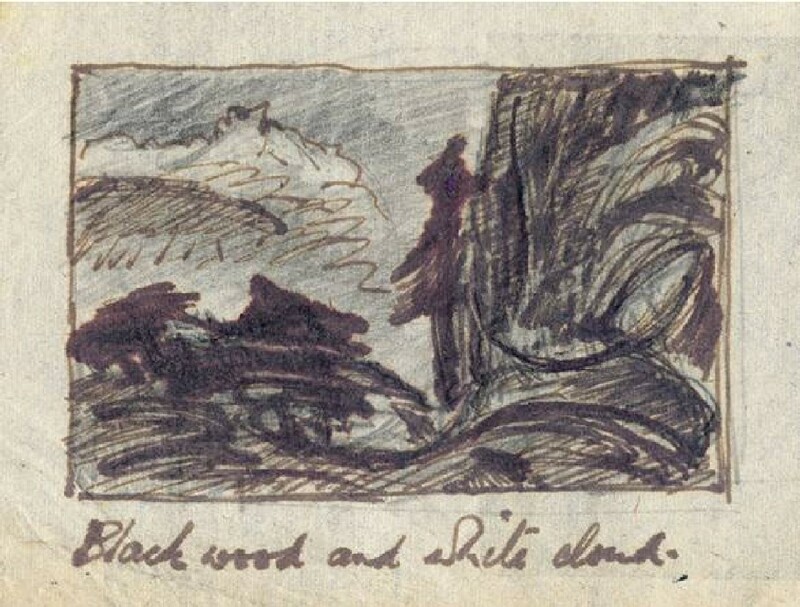 Ending one of his Journal entries, RMS himself wrote: “… whilst encamped, the visual memory must set up a storehouse of fuel for the imagination to consume in its bounds forward.” The few examples shown below can only hint at the breadth of material amassed in RMS’s sketchbooks. 8. Surreal Landscape (As If Windblown). 1947. 3.375”x 5.6875”. K995.09 9. “Chance Medley”. 1949. 5.5” x 7.25”. K1048.01. While completing the three-part database remains the top priority (see “RMS Trust & the Database”), producing an illustrated Catalogue Raisonné is an ambitious project to be implemented as soon as possible. The Illustrated Catalogue would be an edited version of the Database, reproducing groups of drawings that are inter-related, and giving emphasis to the more important works (see suggested page-layout above). With 300 or more high-resolution photographs ready to install, a good start can be made. Preparatory work on this project is in hand. Alongside the various tasks already described, and mostly in hand, is the preparation of a 'Reserve Touring Exhibition' of say 50 works,. 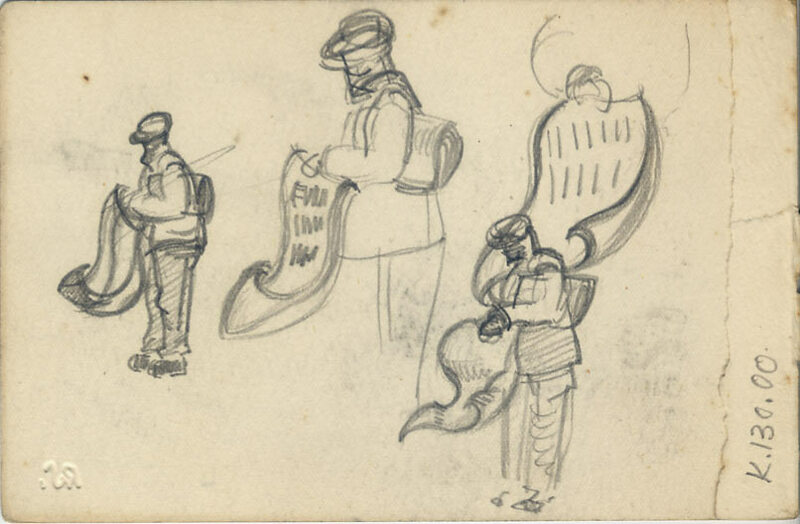 This will be selected from the drawings and paintings to be retained by the RMS Trust when the full extent of the Archive is documented in detail. Its selection will need to be representative of RMS's work as a whole, as will be the selection for the Archive itself. This applies too, but in much smaller measure, to final selection of the artist's son's collection. However, if this 'Reserve Touring Exhibition' can be put together earlier rather than later, it could immediately operate as a kind of touring 'flagship' for the Archive. We cannot embark, even on the first essentials of this task, without re-activating our photographic campaign. That is because using photographs to help edit these collections will be the only practical way for us to assess, compare and re-distribute so many works. Slow progress results from the absence of funding available to support small ‘unfashionable’ causes like ours. 12. 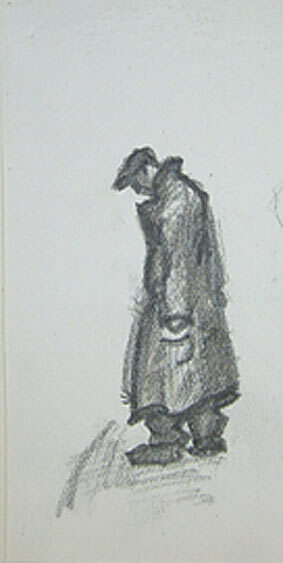 Figure of a Man. The RMS Trust’s uncertainty of tenure of its premises, if coupled with the potential loss of the family-based fund of knowledge, would, in the event, prevent the continued expansion of the database records in the detailed manner so far employed. For these reasons it is important to hasten the rate of progress. The Trust would like to work with an interested Institution in seeking the necessary support to achieve its database objectives, which will fundamentally enhance the inter-disciplinary research value of the Archive. 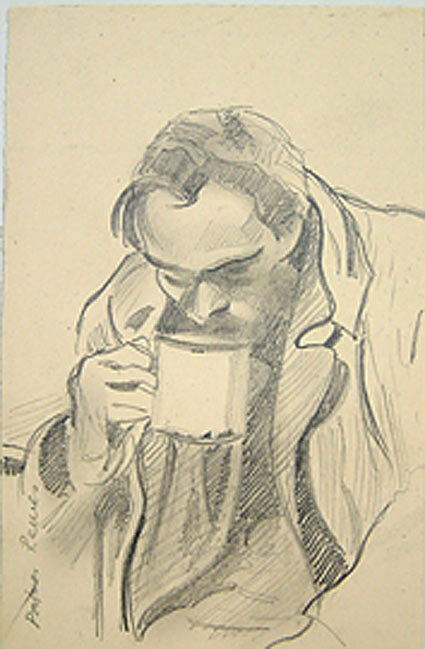 The Trust would seek a clearly defined and staged programme for photography of the outstanding paintings and drawings, and of the Journals and more significant paper-back and other notebooks containing Maynard Smith’s writings. There are already a good number of architectural photographs. As things stand, basic text-only database records of the Drawings & Paintings have recently been completed - that being the largest of the three disciplines destined for the database. NB. The RMS Bequest, being testamentary, would support the RMS Archive in whatever form is finally agreed.